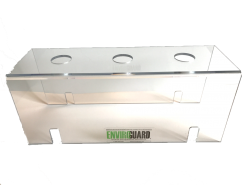 EnviroGuard is the global leader in battery room products and environmental health & safety training. We provide customers with a complete line of safety equipment and other supplies for the battery room. Our product line includes a wide variety of safety and compliance products including spill containment, spill clean-up kits, protective eye wear, tools, hydrogen detectors, battery watering carts, and much more. Our newest line of Battery Racks meet the latest federal, state, and local compliance regulations and requirements. UBC, IBC 2012, IEEE 693 Moderate, IEEE 693 High, and NEBS standards have been taken into consideration when designing and engineering our seismic rack. Kit includes: 20-Gallon D.O.T. container, 3 neutralizing & absorbing pads, 2 neutralizing & absorbing SOCs, 2 pairs of Tyvek full body coveralls, 2 headgear/face shields, 2 goggles, 2 pairs of rubber gloves, 2 disposable respirators, 2 hazmat disposal bags, 20 absorbent wipes, 1 scoop and brush, 1 roll of duct tape, 1 pH test kit, 1 emergency response guide book, 10 lbs. NuetraSorb (acid absorbent & neutralizer). Also available for NiCd and Motive applications. A box of 10 pillows in each quantity. Protecting Mission-Critical Facilities and Personnel since 1993.